Commute times in big cities can change wildly based on time of day. For instance, in Hawaii a commute that takes 15 minutes at 10AM can easily take 40 minutes at 6:30AM. Knowing how traffic affects your commute is critical to deciding where to live at your next base. Enter Google Maps. They have a feature that shows traffic delays based on time of day. 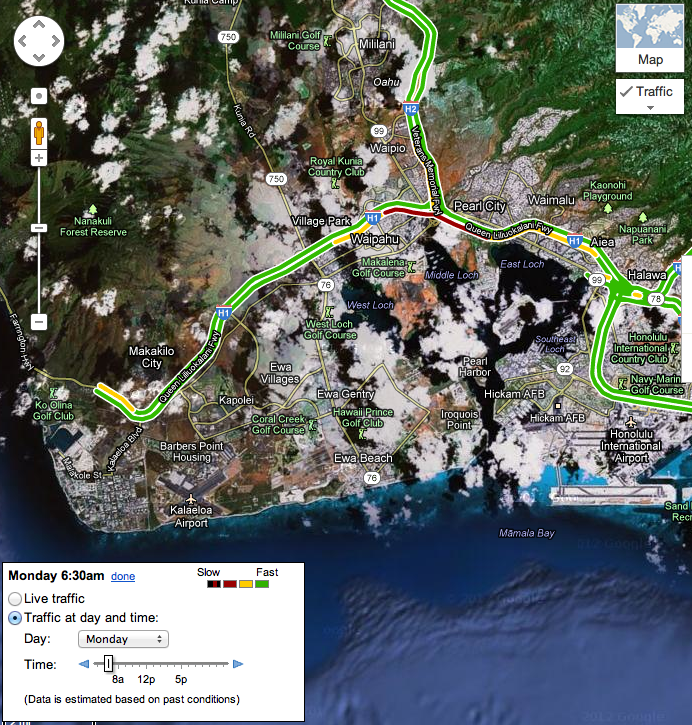 So you can see in the example that traffic on H-1 will be at its worst at 6:30AM. If you commute on H-3 you will rarely encounter traffic. This could make housing in that area more appealing. To change the day and time, adjust the options in the text box in the lower left portion of the map.